Spicy Sriracha Roasted Red Potatoes. The same great crispy on the outside, creamy on the inside texture of your traditional roasted red potatoes but with a deliciously spicy twist. These versatile little spuds are super easy to make. 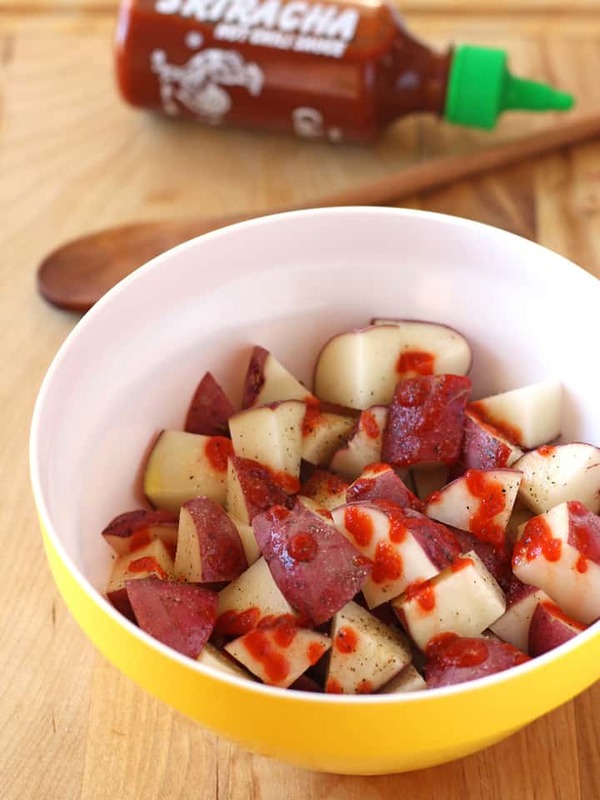 Just toss your chopped red potatoes with a little olive oil, Sriracha sauce and a tiny bit of garlic salt. The key to getting them really crispy on the outside is preheating your roasting pan. Our toaster oven heats up lightning fast. So we just stick the pan in, turn it to 450 F and in the time it takes to mix the chopped potatoes with the oil and Sriracha sauce the pan/toaster oven are ready. A full-sized oven takes about 15-20 minutes to fully preheat so you might want to do this step before you start chopping the potatoes. Once the potatoes are seasoned and the pan is ready slowly pour the potatoes onto the searing hot pan. Be extra careful here. It’s like dropping something into a tiny deep fryer, there is a lot of potential for hot oil splatter. The oil only sputters for a few seconds, then you can spread the potatoes into an even layer and pop the pan in the oven. Make sure to stir the potatoes a few times while they cook, about every 10 minutes. This helps to prevent sticking and ensures all of your potatoes have golden crispy edges. 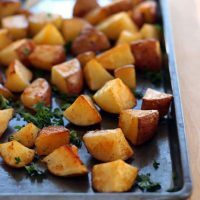 You’ll know they are ready when the potatoes are crispy and browned on the outside and a fork easily slides into the middle. 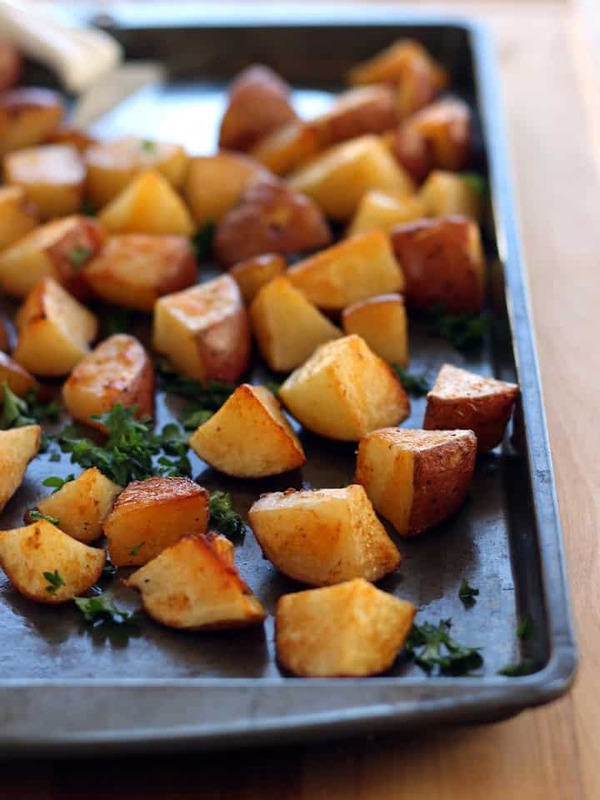 These spicy roasted potatoes are a delicious dinner side dish served hot from the oven. But I see a more creative future for them. Like the base of a breakfast burrito bowl with the perfect Soft Boiled Egg (← best tutorial ever!) or combined in a salad with chickpeas, greens and our Sriracha Vinaigrette. Sriracha Potato Yumminess Update: These tasty little spuds found their way into a recipe for super filling vegetable stuffed Mango Sriracha Potato Veggie Bowls! Any way you choose to serve them (or maybe you skip the plate and stand at the pan eating them like I may have) I guarantee you’re going to love these perfectly crispy creamy Spicy Sriracha Roasted Red Potatoes. 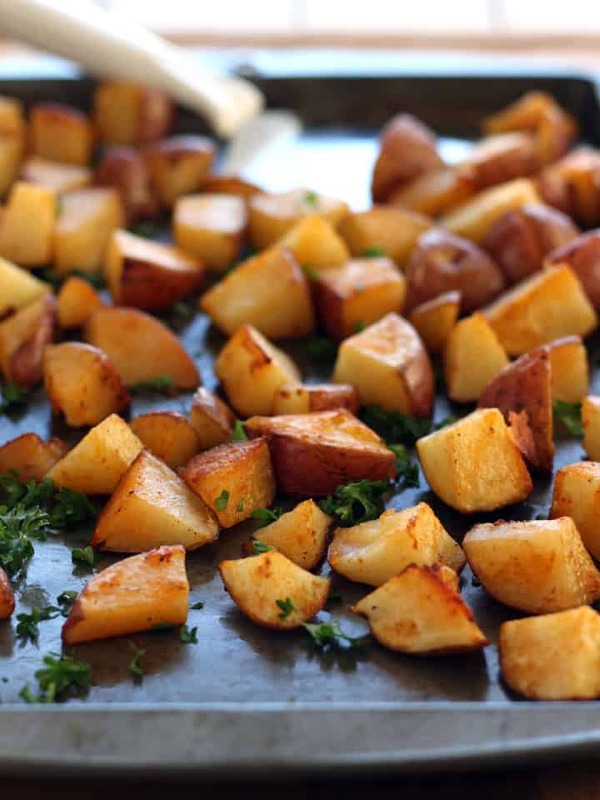 Jump-start your taste buds with these spicy roasted potatoes. Each piece is lightly crisped on the outside and creamy inside. Place roasting pan in oven or toaster oven and preheat to 450 F.
In a medium bowl whisk together the olive oil, sriracha sauce and garlic salt. Add chopped red potatoes to bowl and stir well to coat all of the potato chunks. Lightly season with salt and pepper if desired. Using oven mitts carefully remove the heated roasting pan from your oven or toaster oven. Carefully add oil coated potatoes to pan (the oil will pop and splatter), use a rubber spatula to scrape all of the oil/Sriracha mixture from the bowl and onto the potatoes. Spread potatoes into an even layer and return pan to oven or toaster oven. Roast potatoes at 450 F for 30 to 35 minutes. Stir potatoes about every 10 minutes to keep them from sticking to the pan and assist with even browning. Remove potatoes once they are crispy on the outside and fork tender. 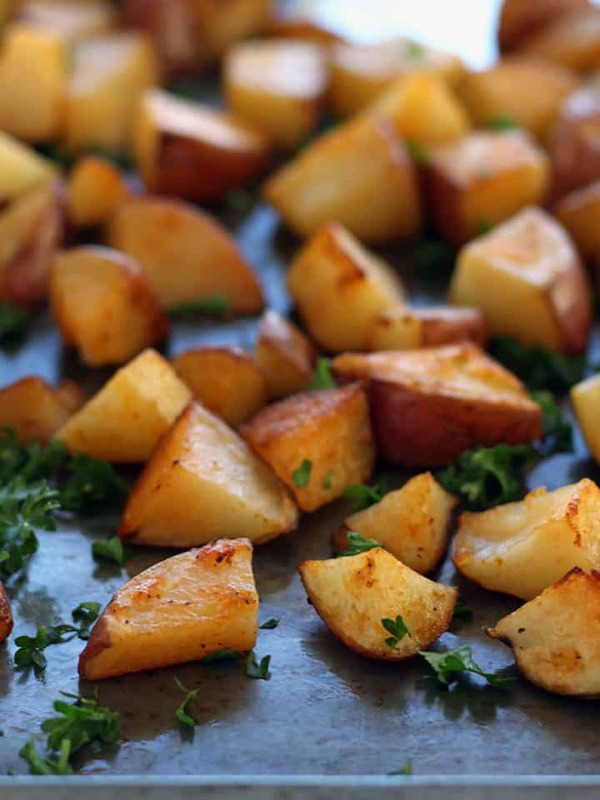 Transfer cooked potatoes to a bowl, sprinkle with salt, pepper and fresh parsley. Enjoy! 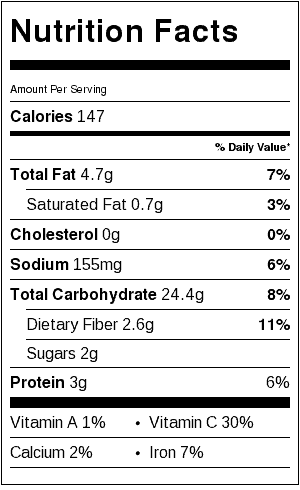 Nutritional information is an estimate for 1/3 of the roasted potatoes. Awe thanks Adina. Well it sounds like a good Sriracha sauce knows no boundaries 🙂 Hope you and the family have a great New Years! Totally agree Sriracha = better always 🙂 Thanks Eric and Merry Christmas!